Mariann Alice Martens (July 23, 2018) | Burmeister-Johannsen Funeral Home, Inc.
Mariann Alice Green, the daughter of Charles Julius Green and Alice Rachel (Funk), was born March 26, 1929 in Harlan, IA. She attended country schools in Menlo, IA and Fairview Township, Shelby County, Iowa until she entered high school at Shelby Consolidated Schools. She graduated in 1947. On October 19, 1947 she married Robert William Martens at the United Lutheran Church in Shelby, IA. They had three children. Bob and Mariann farmed around the Shelby, Corley and Persia areas until 1967, when they moved to a farm north of Walnut, where they lived for a year before having a sale and moving into town. Mariann began working as a cleaning lady at Peace Haven retirement home that year, and she held that job for 27 years. Mariann will be remembered as a wonderful mother, grandmother, great-grandmother, great-great-grandmother, aunt and friend by many. She was “famous” for her Danish coffee cakes, which she loved to make for church functions as well as for family and friends. Her proficiency in the kitchen wasn’t limited to coffee cakes, however; she was an excellent cook and baker. She was also a very good seamstress and made most of her own and her children’s clothes in her younger years. She began gardening at a young age, and learned from her sister, Viola, how to grow and arrange beautiful flowers. She continued to tend her flower beds through last fall and was also known around town for spending countless hours picking up sticks and leaves from her lawn. Mariann also enjoyed sending and receiving cards, collecting pretty dishes and glassware, reading, doing word puzzles, genealogy and spending time with family and friends. 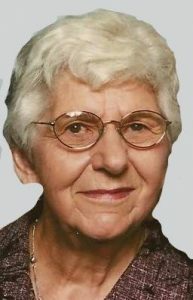 She was a member of the Walnut Genealogy Club, Walnut Community Club, Red Hatters and Peace United Church of Christ and its Women’s Fellowship. Mariann passed away on Monday, July 23, 2018, at Heritage House in Atlantic, IA, at the age of 89. Mariann is preceded in death by her parents, husband, and two half-sisters, Viola Miller and Elda Woodward. Survivors include her three children: Chuck Martens of Omaha, NE; Becky Rasmussen (James) of Bellevue, NE and Cheryl Butcher (Eugene) of Avoca, IA; six grandchildren: Gena Rasmussen DeRosier (Scott) of Bellevue, NE; Julie Rasmussen Blake (Joseph) of Palacios, TX; Rachael Rasmussen Johnson (Ryan) of Omaha, NE; Eugene Butcher, Jr. (Sandy) of Avoca, IA; Shari Butcher Kay (Dale) of Shelby, IA and Christi Butcher Zimmerman (Ryan) of Avoca, IA; 18 great-grandchildren: Dustin DeRosier (Lacie); Dillan, Amberlee and Daniel DeRosier; Haylee Blake Huddleston (Kade) and Joey Blake; Chloe’, Liam and Levi Johnson; Jessica, Sarah and Emily Butcher; Sabrina Butcher, Chelsea and Brittany Kay and Hunter, Colton and Sydney Zimmerman; five great-great-grandchildren: Lillian and Rosalee DeRosier and Carrie, Jackie and Adaline Zimmerman; numerous nieces and nephews. The funeral service was held on Saturday, July 28, 2018, at Peace United Church of Christ in Walnut, Iowa, with Pastor Steve Lewis officiating. Amberlee DeRosier was the accompanist, and Patricia Daub and Ryan Johnson were the vocalists. Serving as casket bearers were Joseph Blake, Ryan Johnson, Eugene Butcher, Jr., Dale Kay, Scott DeRosier, and Ryan Zimmerman. Burial was in the Shelby Cemetery, Shelby, Iowa. The Burmeister-Johannsen Funeral Home in Harlan, Iowa, was in charge of the arrangements. Condolences may be left online at www.burmeisterjohannsen.com. Uncle Bob and Aunt Mariann are missed by so many family members, friends, and our family. We will miss visiting on the phone and in person. The Hindman family. Thinking of you Cheryl and all the family. My deepest sympathy to you, Mariann’s family, I was privileged to be at Peace Church July 1 with your loved one, we shared a wonderful mutual hug. My parents Carl & Juanita & sister Ardelle lived at Peace Haven for many years during the time Mariann worked there. She often brought her beautiful flower arrangements for my sisters birthday in July. A loving wonderful woman like none other, may God give you guidance & peace now & always. What beautiful picture of your mother who was just as beautiful inside and as outside. She was loved by so many.